From early beginnings with Roman glass design to design glass works of the 1950s and 1960s, glass pieces have always had a place in the most stylish of homes. Whether chunky, or delicate, bold colours or pastel opaques, you will find your perfect piece on Barnebys. Check out a selection here, click on the item to visit the sale. 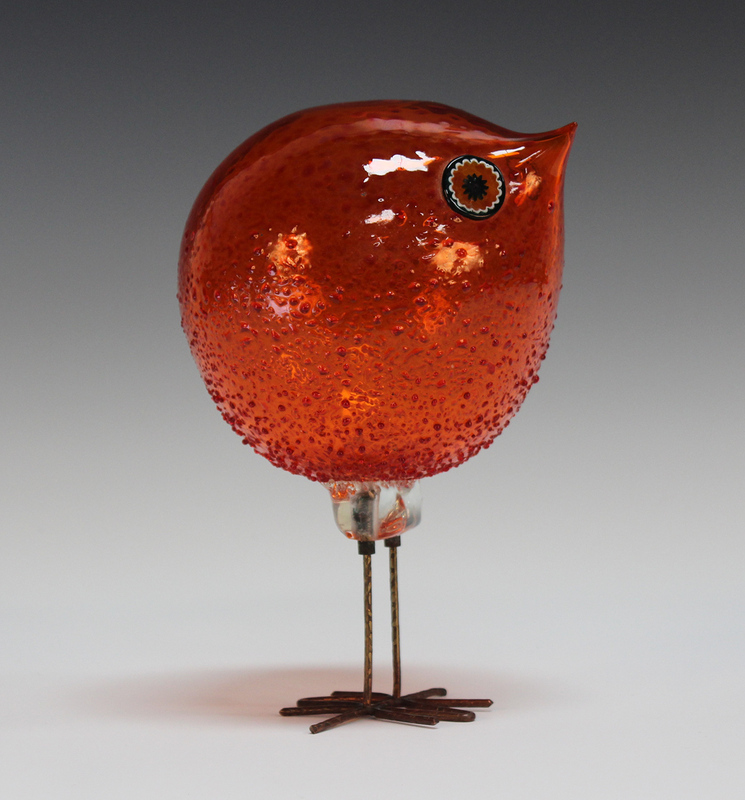 A 'Pulcini' glass bird sculpture, designed by Alessandro Pianon for Vetreria Vistosi, circa 1962, the orange body with darker orange mottled and splattered detail, applied with murrine eyes and raised on copper leg. 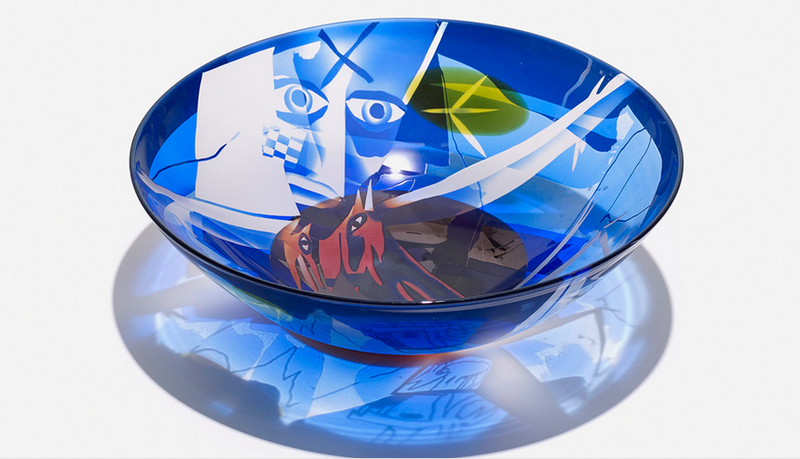 This piece is a stunning piece of Italian Design glass and showcases the whimsical side of glassware. An Ann Wolff bowl, Germany, 1986. 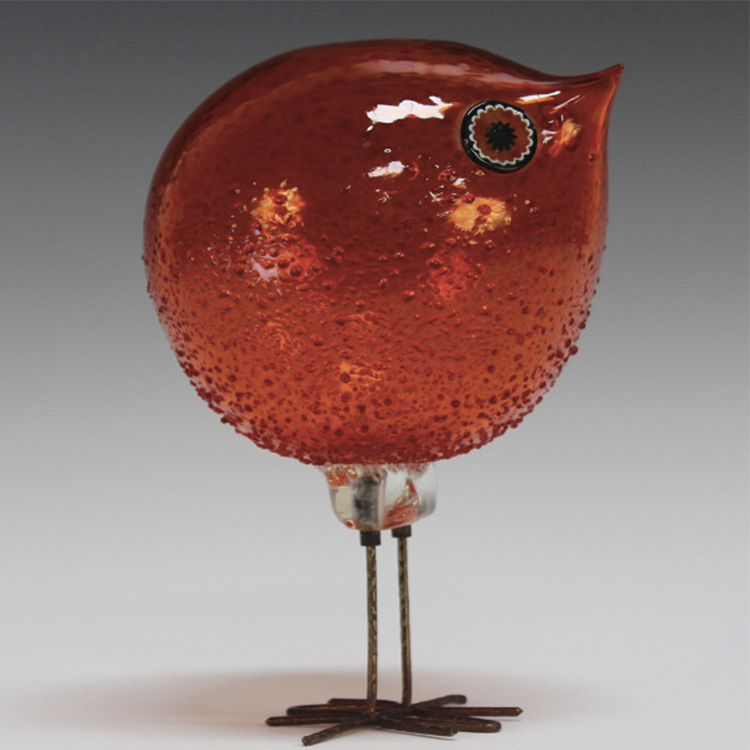 Ann Wolff has been working with glassware since 1974. Her bright designs capture the bold lines of Cubism as well as the striking colours of Pop Art. These three abstract works features an Italian piece by Murano as well as possibly American pieces from the late 20th or early 21st century. 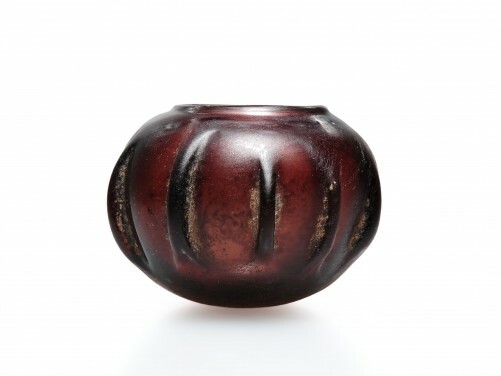 This piece is spectacular, it is a Roman Ribbed Glass Bowl, Eastern Roman,circa 5th Century A.D. It has a rich aubergine colour and has been blown to create a squat hemispherical body with nine pinched ribs and everted raised rim. 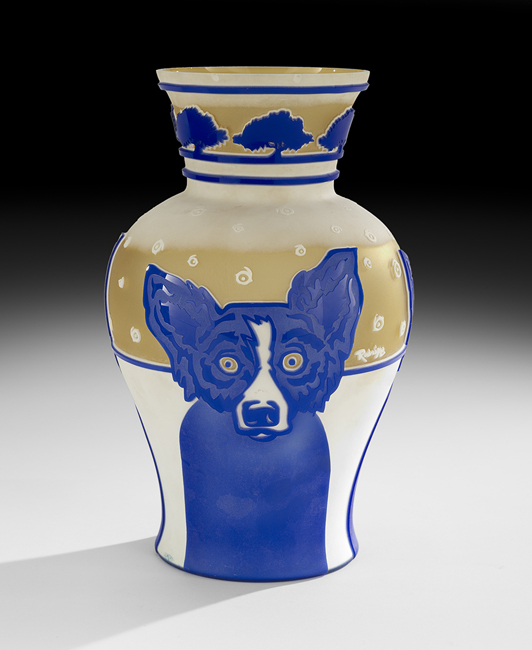 This is a rare Cameo Glass "Blue Dog" Vase, designed by artist George Rodrigue and produced by Pilgrim Glass Company. Rodrigue's blue dog became iconic in the 1990s. The dog, inspired by a Cajun legend, saw the artist reach new heights of fame. Another name in Italian glass, Venini. 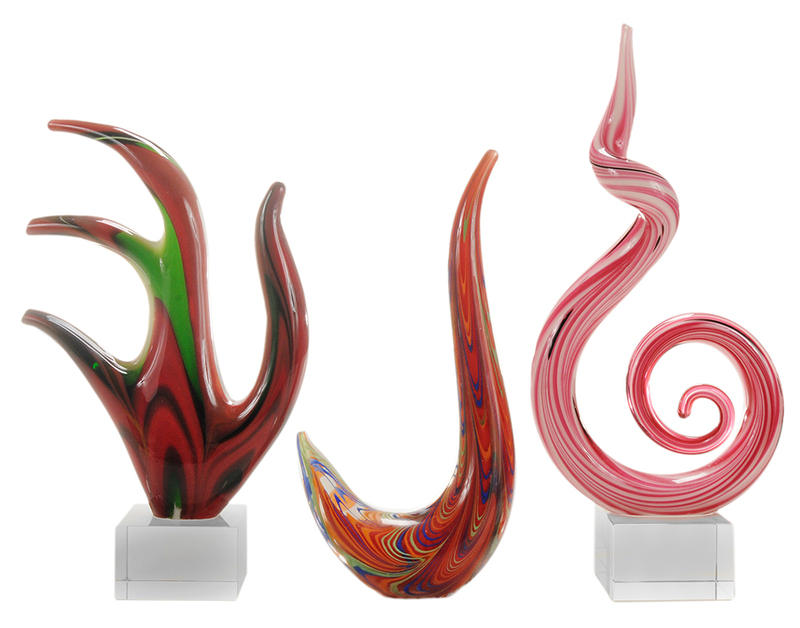 These pieces were produced in the years 2006 and 2009 and were made of mouth blown Murano glass. 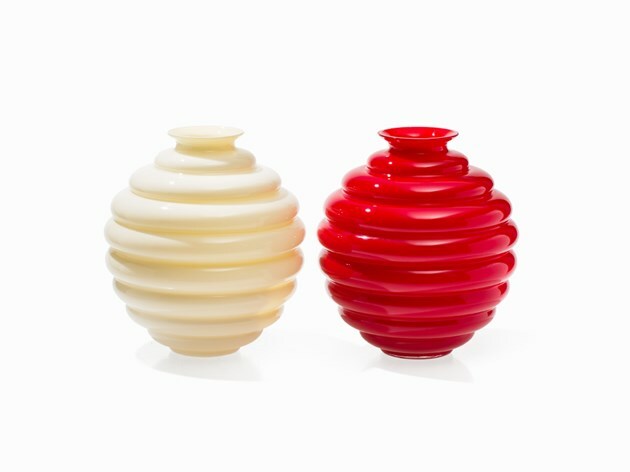 One of the vases is fitted with a luscious red underlay, while the other one bears a gentle white colored underlay. The voluminous corpus of the ball vases is ribbed horizontally. Base, neck and mouth are only formulated flat. Finally, the French master of glass decorative arts René Lalique. 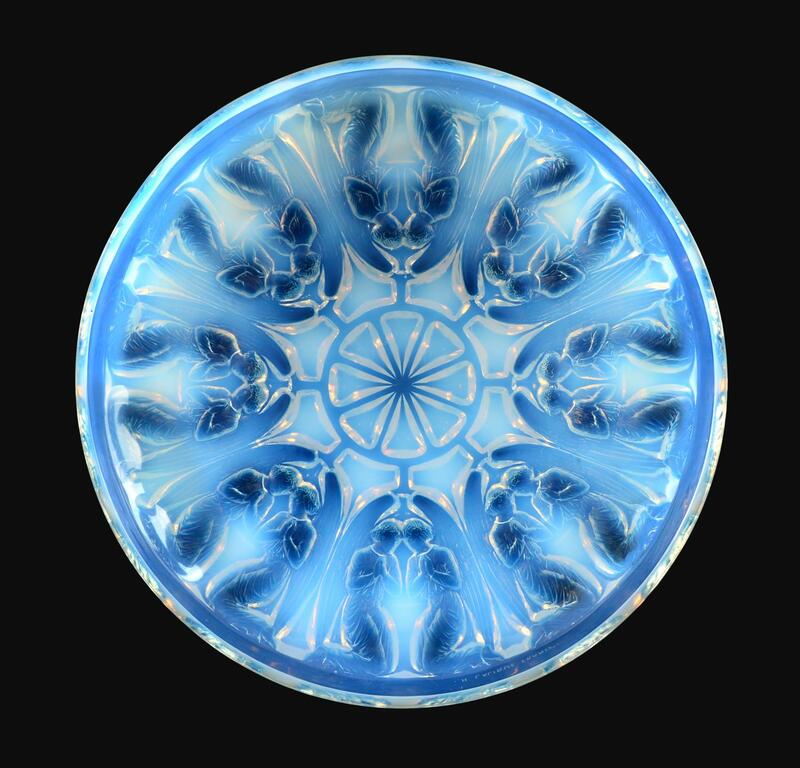 This is an Anges Opalescent and Blue Stained Glass Bowl , No.410, the underside moulded with eight pairs of kneeling angels facing each other, their wings forming arches, centring a floral medallion. Its ethereal design portrays Lalique's delicate designs.